Following the screening and discussion of the documentary ‘The Voluntourist’, our team took the opportunity to ask the movie’s director, Chloe, a few questions. Back in August the Kaliyan Mith ChildSafe team organized a screening of the movie “The Voluntourist” at the Hangout Hostel in Siem Reap. “The Voluntourist”, directed by Chloe Sanguinetti, puts the spotlight onto some young voluntourists and their motivations for volunteering, along with their thoughts on the real impact that their efforts are making. It has proved a welcome addition to the growing debate on the issues surrounding the growth of voluntourism, particularly those relating to children and child protection. 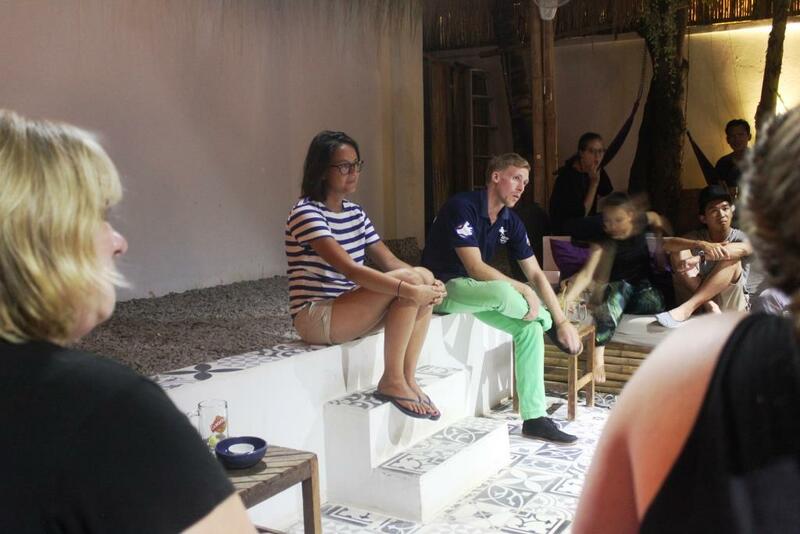 The screening was followed by a discussion on volunteering in Cambodia, in particular on the growing local industry of voluntourism, the effects it might have on children and on the local community, and to also tackle what would constitute responsible volunteering. Following the screening and discussion the team took the opportunity to ask the movie’s director, Chloe, a few questions. How many screenings have you done of the Voluntourist so far? Since the release of the documentary in September last year, I have done around 20 screenings and presentations. Most of them took place in the UK, but also the US, Australia and Cambodia. Can you tell us about the reasons why you decided to make this documentary? When I was 18 I participated in a voluntourism program in Vietnam. I paid a ridiculous amount of money to teach English to (so called) street children in Hanoi for 10 days. At my first lesson I really questioned why I was there. I’d never taught before, never worked with children before. The most striking thing was that I also realized that the children in my ‘class’ knew this. They’d seen conveyor belts of well-intentioned volunteers coming to teach them how to count to ten, and I was just another of them. I felt ashamed to have assumed that my ‘help’ was needed. I came home, resumed my studies, and never stopped doing research about voluntourism. I even wrote my final year essay about the sociology of volunteering, mapping out who decides to volunteer and why. After graduating I set out on a round-the-world trip for 18 months, and decided to film short-term, unskilled volunteers in different countries and question local organisations about their need for this type of volunteering. I conducted around 25 interviews with volunteers, local organisations, local people working with international volunteers and child protection organisations. All this footage then became the film The Voluntourist. The film tries as much as possible to raise awareness of this type of volunteering. Can you give us more info on the ongoing impact of the documentary? As I was filming I didn’t really think about the impact that the documentary would or could have. It just felt like I was filming for myself, asking questions to volunteers to satisfy my own curiosity in a way. But it turns out that voluntourism is a hot topic right now and a lot of people showed interest in the film, which was a great surprise. The film has been viewed around 12,000 times so far and has been used as educational material by a few different organisations; volunteer sending agencies and even universities. I’ve also had positive feedback from volunteers: two days after the launch of the documentary, I received an email from a volunteer who was working in an orphanage in Cambodia. She said she’d watched the film and stopped her placement right after. She was writing to thank me. It was really heart-warming and encouraging. It’s now almost been a year since the documentary has been out and I keep getting requests for screenings and debates about the topic. I really feel like the film has been a part, if only small, of the global debate on voluntourism and hopefully will keep on being an impactful film for people who are thinking of volunteering. Now that you are living in Phnom Penh, have you got any plans on producing a second documentary? Can you please tell us about your projects? I have recently moved from London to Phnom Penh for work. Aside from raising awareness about voluntourism through the film I am also a freelance communications consultant. I am currently looking for work, doing educational videos mostly. I never stop thinking about making another documentary, maybe on voluntourism, maybe on another topic… I don’t want to say too much as nothing is certain, and I am more in a ‘research’ phase at the moment. But I definitely will not stop making documentaries. I am still available for screenings and presentations or even just for a chat about voluntourism, I can be contacted through the website http://www.the-voluntourist.com. If people are interested in the topic, they can follow the Facebook page of the film: https://www.facebook.com/TheVoluntouristDocumentary/, or the Twitter: @VSolidaires. (Thank you to Chloe and to the Kaliyan Mith Siem Reap ChildSafe Team.